Another newcomer to AT’s annual awards, the Whitsundays proved to be Australia’s most romantic location, earning an unrivalled lead. Made up of tropical islands in the heart of the Great Barrier Reef, with azure seas and world-class beaches – few places can compare. Boasting many private pockets with white sandy stretches for walks, beautiful Coral Sea sunsets and a kaleidoscope of coral and local wildlife, there are many experiences here to share with your other half, be it at sea or on land. Couples can also expect many high-end restaurants, as well as an array of luxury stays to snuggle up in, making it as one reader said, “our slice of paradise”. 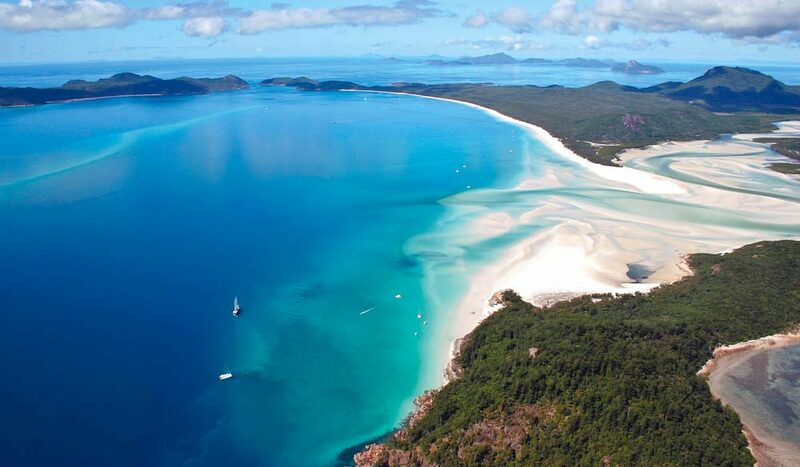 Readers suggested a number of ways to experience the romance of the Whitsundays, with many encouraging local sails and or a visit to “Whitehaven beach – the best picnic in the world”. With harbour views, luxury stays and chic bars, Sydney (sydney.com) was a hot favourite for a romantic escape, as was Melbourne (visitmelbourne.com) for its amazing restaurants, boutique hotels and thriving art scene. Broome (broomevisitorcentre.com.au) was also nominated for its long beaches and stunning sunsets over the sea, and Port Douglas (pddt.com.au) for its stunning surroundings, secluded atmosphere and impressive restaurants.